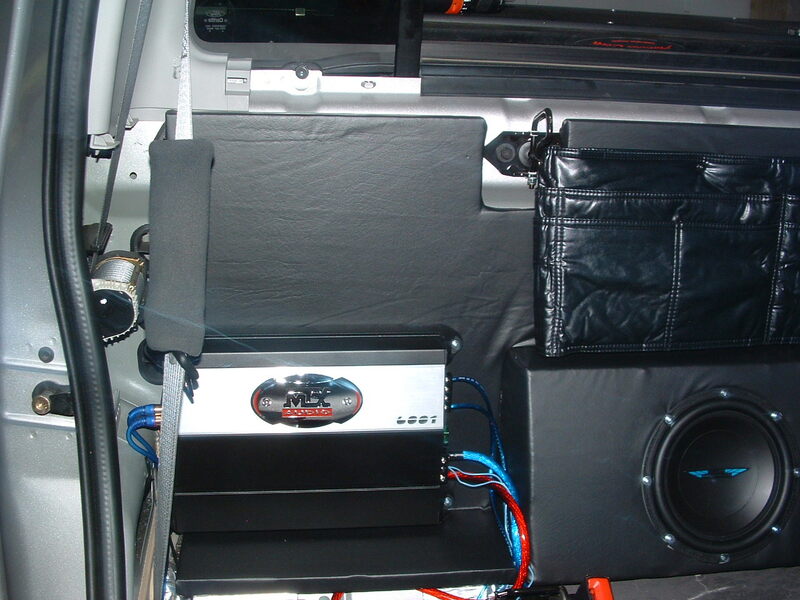 I'm going to build my own box and amp racks for two subs and two amps to go behind the seat of my Explorer Sport Trac. What's the recommended method for securing the box ... screw into the back panel (metal) of the cab? I've seen some say velcro (or glue ... don't want to do that) but will it be strong enough? I do want to be able to remove it when necessary. Lot of people looking but not responding I really don't want to drill into the vehicle, so was wondering if some strong, wide-banded velcro would work. My idea is to screw the bottom part of the enclosure into a panel, but then secure the top part of the enclosure to the back via velcro or other similar method. The back seat would then fold to conceal everything but I don't want it to vibrate and mess w/the sound. that's a bad comparison Neo, if you were 2ft wide, 1.5ft tall (and 10-15 in depth, like a box), 150 lbs & carpeted all around you will barely move in a car... as long as the floor inside the car is also carpeted. I actually finished the box and didn't have to screw it in. 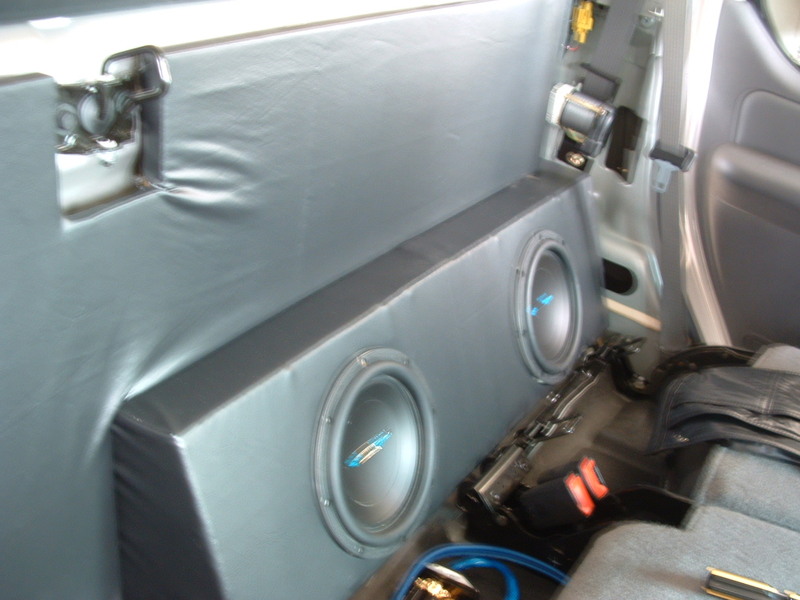 Measured carefully and with the sound deadening material and vinyl, it fits very snug. Took some pics at dusk so they're not the greatest yet, but here it is anyway. This is my first time building an enclosure but it's done and my IDs sound incredible so guess I did ok. Still need to tune it with current Polks, then retune when I get my new components. looks like good stuff, nicely done! It's behind the rear seats of an Explorer Sport Trac, meaning it has nowhere to go in case of an accident since it sits very tight behind the seats. The seats were down for the photos. I too have a Sport Trac and would like to do that same thing. Is there any way you could send the plans to me? Sure I can ridered, but will have to wait until the weekend since I'm out of town and have the plans on another computer. 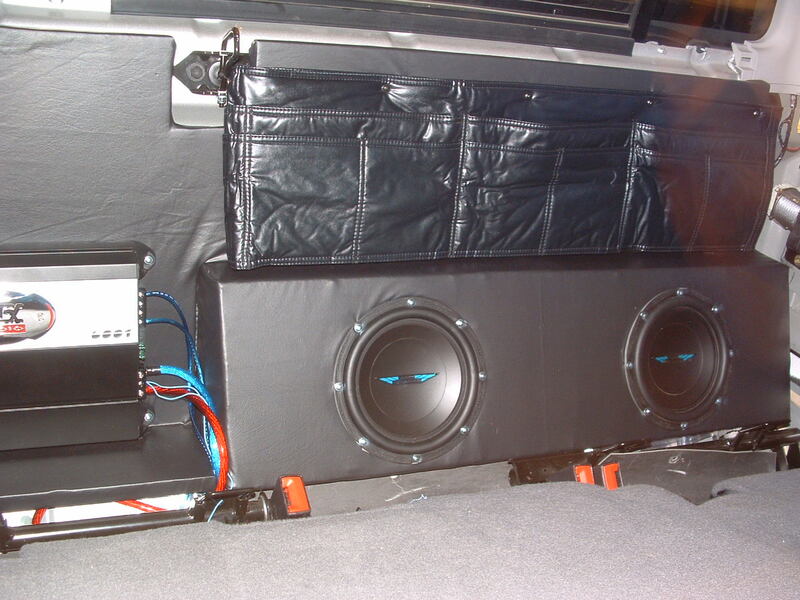 Just to clarify what you said, you want to do a dual enclosure and the amp setup like mine? Need to know what subs you have and I'll plug them into Probox to check the volume you need for your subs. Real quick dimensions for the sub enclosure is: 36" wide, top depth 3.5", bottom depth 7". Used 3/4" MDF. I have 1 MB Quart PWE 252 I have an Alpine MRD-M605 on the way. Whenever you get a chance to send plans is fine im not in a big hurry but I would like to finish it as soon as possible. Hmmm, just a thought but you might want to ask some of these guys about mixing subs. I don't know for sure, but a lot of forums I've been on suggest it's bad to mix different subs. Either way, I'll check out specs for you but do check on this site and others like caraudio and elitecaraudio to be sure before you mix them. LOL, thanks neo ... haha, I just automatically "assumed" ... shouldn't have done that. I started using these really cool threaded inserts I got from a company called McMaster Carr. They are basically threaded rivets that work really well. I think the commercial name is nutserts. :cool: " He who dies with the most equipment wins Right ? "